After nearly 18 months, the Save the Historic Kinsol Trestle campaign is entering the final fundraising push while time remains to securing matching grant funding dollars for the project. And what a treat it is to be involved with this great undertaking. If you haven’t yet added your name to our donor list, please make your gift today. Every donation over $100 will be acknowledged on the permanent donor wall that is going to be erected at the Kinsol Trestle site. You’ll also receive a tax receipt. And remember, every dollar we collect from the local community will unlock matching grant funding, which is a real benefit for our campaign; however time is running out to tap into as many of these additional dollars for the project as we can for the benefit of the trestle! As I said when I agreed to take this on, there aren’t many opportunities in a lifetime to make a difference for generations to come. But rehabilitating the Kinsol Trestle is one of those chances for me and everyone else involved in this effort. We are still working on raising the last $500,000 of the campaign including securing the last major donors. Stay tuned for several announcements we plan to make in the New Year to thank those donors. At this time, I’d like to publicly thank our major sponsors, including the Cowichan Valley Regional District, the federal and provincial governments, the Island Coastal Economic Trust, the Trans Canada Trail and the Cowichan Foundation. In addition, we have been receiving great support from our media sponsors — the Cowichan Valley Citizen, the Cowichan News Leader Pictorial and SunFM 89.7. We continue to have tremendous support from across the entire Cowichan Valley community. In addition to the historical significance of protecting this local landmark there are going to be lots of economic and recreational benefits for local businesses and the community in general. When we started our campaign, there was still a bit of a niggling “if” attached to the phrase “Kinsol Trestle rehabilitation.” But no longer. Early next spring, we’ll celebrate the grand re-opening of the Kinsol Trestle with a party worthy of this structure. In the years ahead, our children’s children will be walking across the trestle, staring down at the Koksilah River through the graceful curve and weathered beams and being told of the industry, skills, audacity and sheer tenacity of those who built this engineering marvel in the wilderness. One of the most exciting economic and recreational benefits of rehabilitating the Trestle is that it will complete the “missing link” in the section of the Cowichan Valley Trail (part of the Trans Canada Trail) between Shawnigan Lake and the Town of Lake Cowichan. In the 19th and early 20th centuries, the transcontinental railroad connected every Canadian province. Today, the 21,500-kilometre Trans Canada Trail route links every province and territory, from the Atlantic to the Pacific to the Arctic oceans. When completed, the Trans Canada Trail will be the world’s longest recreational trail, connecting close to 1,000 communities and over 33 million Canadians. The historic Kinsol Trestle here on Vancouver Island will be an important part of that national link. When the trestle is reopened next spring, bikers, hikers and equestrians will experience the full Trans Canada Trail in the Cowichan Region, as concurrent work is underway to complete key sections of the trail from the Town of Lake Cowichan through Chemainus and Ladysmith with the Nanaimo Regional District’s trail system. Work is also planned to start shortly on the trail-routing design to connect the Cowichan Valley Trail with the Galloping Goose Trail in the Capital Region via the Malahat ridge. The trail traffic is going to mean opportunities for new business ventures to cater to service the visitors to our area taking advantage of the recreational opportunities. And that means the Kinsol Trestle, which saw the last train cross in 1979, will once again play an important role in the Cowichan Valley economy. Since rehabilitation work on the trestle began in July of this year, it’s been continuing non-stop, replacing unsound timbers, reinforcing eight structural piers and building a new 614-foot walkway atop the structure for hikers, runners, cyclists and equestrians. The rehabilitation ensures that the historic characteristics — the span, height and timbered design qualities — of this wonderful structure will be preserved as the original timbers get replaced due to age and deterioration; not unlike the ongoing maintenance requirements of any active wooden trestle serving a railway line. Included in the rehabilitation project are landscaping improvements on both ends of the trestle, a walkway going down into the Koksilah River Gorge from which the true visual impact of the trestle will be appreciated, and information kiosks that will display the proud story of the trestle as well as the contributions of the donors. Thanks to everyone so far. I look forward to a successful completion of the campaign and invite everyone to join us at the grand opening in the spring. 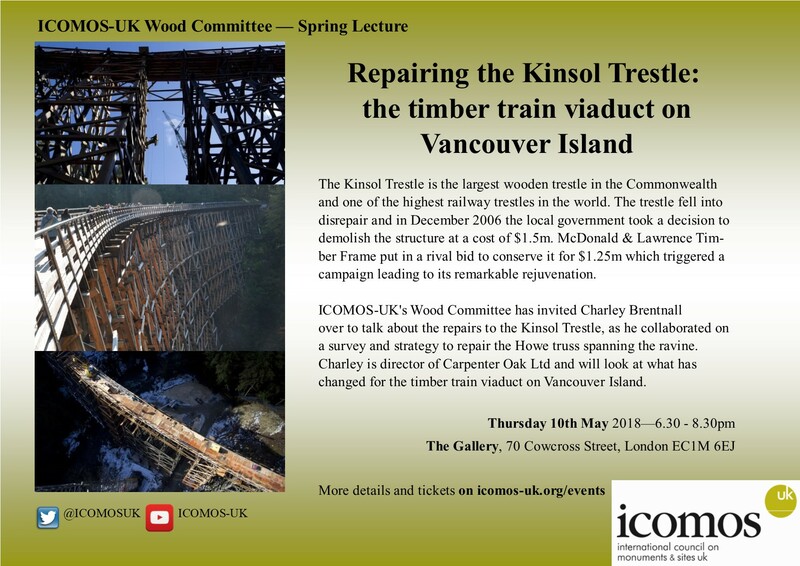 Jack Peake is the chair of the Kinsol Trestle Capital Campaign.